Elkhart, South Bend, and Mishawaka drivers know by now that the 2016 Jeep Wrangler offers unparalleled performance and technology features. But along with this, the new Wrangler is also distinguished from the competition by its powerful array of security devices and systems, which help turn this new Jeep into a veritable fortress of safety. From its airbags and Stability and Traction Control systems, to its Trailer Sway Control and Keyless Entry system, the 2016 Jeep Wrangler is designed to ensure the safety of you and your passengers, no matter the conditions in which you find yourself. First of all, the Wrangler gives you an assemblage of powerful airbags, including standard advanced multistage front airbags, which can inflate at various levels depending on the severity of a collision, as well as sensor-operated side-supplemental airbags. Protected by this swathe of airbags, you and your passengers can rest assured next time you’re off-roading near the Dunes or hurtling through a forest at high speeds. Not just a single system, the Stability and Traction Control system gathers together a number of high-quality devices—Electronic Stability Control and Electronic Roll Mitigation, All-Speed Traction Control, Brake Assist, and Four-Wheel Disc Antilock Brakes—to help guarantee that your Wrangler will remain safe at high speeds on the highway. Especially useful when you’re lugging heavy loads down the highway, Trailer Sway Control prevents your trailer from drifting or swaying too much and endangering you or other vehicles around you. One of the latest in advanced security systems, Keyless Entry allows you to lock or unlock your Wrangler from a distance of 50 feet, making it possible for you to open it up for someone else without even getting out of your seat! 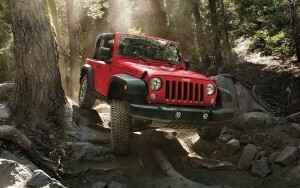 Explore the Jeep Wrangler Today! South Bend, Mishawaka, and Elkhart drivers are cordially invited to explore these safety features for themselves by visiting Sorg CDJR, located at 1811 Elkhart Road in Goshen, contacting us online, or by arranging a test drive via telephone at 574-533-8605. Experience real safety in the 2016 Jeep Wrangler!